There are two major milestones that autism-focused business Reaps the Sweetest Reward of All a parent of a differently-abled child fears the most. One of those worries revolves around the concern of what will happen to their child when they are no longer around. Many of us who are brave enough to actually voice that concern often discuss the lack of housing opportunities for our adults on the spectrum. Whether our child is just one little bitty bit short of being totally independent, or whether we have a child that requires 24-hour supervision, the problem is the same: there are so few options for adequate housing. The second concern, which usually happens first, is the day our child ages out of the school system. So problematic, it’s been coined, “falling off the cliff.” For many of our graduates, there are often very few viable opportunities for adult programming or job training even in larger communities. In 2011, two full years before my son, Blake, a young man with autism, was scheduled to graduate high school at the age of 22, I began my search for “life after school.” I called every agency in my town, visited programs, spoke with adult day training directors as well as executive directors. I even organized an inter-agency meeting to try and bring the community together to help get the ball rolling on the development of a pilot program for individuals like my son. I offered to volunteer my time and energy to develop the program. But, I came up short. Actually, that’s an understatement. I ended up with absolutely nothing. There were plenty of reasons, but to make this story short, let’s just say, no one wanted to take the plunge. So in May of 2013, one of my biggest fears was coming to fruition. Blake was graduating from high school to the couch. And I realized it was in my hands to do something for him. Serendipitously, my life was heading in a new direction. It was one that I didn’t realize would merge with Blake’s situation at that moment. Let’s just say, it was in the stars. Having sold my speech and occupational therapy center in 2008, I was now teaching part-time at the university and had some time on my hands. In 2010, I began what I had originally thought would just be a hobby of sorts — I decided to take up the pastry arts and began formal training with a local chef. Eventually, I decided to take more specialized courses in chocolate-making, and in 2013, I became a certified Chocolatier. During my pastry and chocolate training, my son would come into the kitchen with me while I practiced. He showed a great interest in the baking process as well as the chocolate work. The fact that Blake was greatly interested in the pastry arts still floors me. This was the very first interest he had shown towards anything, really. Many individuals on the spectrum often are drawn to particular areas — sometimes obsessively. But not Blake. So the fact that he and I were now sharing this bond through our love of preparing desserts was really a very special opportunity for the both of us. And I decided at this point that I had to move forward and promote this situation. He was still in high school at the beginning of this period, so I organized a baking program at his school and volunteered with his class once a month. That led to a summer program for children and adults with developmental disabilities in 2012, which I ran out of my house. Back to May 2013. During the early days of no school, I tried to keep Blake busy as best I could. I found as many extracurricular activities in the community that he attended (which were very few), and we baked and made chocolate for all our friends and family. Occasionally, one of my acquaintances would hire us to make something for a party or for a special occasion. But these orders were few and far between. We were having fun, but it was definitely difficult to fill up the day with activities as our family is small and there is just so much chocolate and pastries that they could eat. So, I then toyed with the idea of starting a small chocolate company that we could easily run out of my home. Having investigated our state cottage food home kitchen industry rules and regulations, I set out to put together a structure. Blake’s brother, Hunter, always a wit with words, came up with The Chocolate Spectrum. But it was the tagline that really defined what would eventually become the mission of our company: Creating Sweet Opportunities for Those with Autism. If you notice the “s” in the word “opportunities,” then you will realize that I must have always known in the back of my mind that this business would reach out to others in our community. I don’t know if I really understood that clearly at the time, but it must have been what I was really thinking. My original mistake was assuming that a little business would only take up a few hours a week or the time I wanted Blake to devote to this endeavor. That was really a huge miscalculation on my part. Yes, the chocolate-making time with Blake was under control, but the actual business component required an amazing amount of energy and time. There was a huge learning curve for me as I attempted to do everything on my own, i.e., website, social media, purchasing supplies, marketing, etc. But we were a two-person operation, and the last thing I thought I wanted to do was spend tons of money on business development. This was supposed to be just a little venture to keep Blake busy, after all. So I had no plan-no concept of what we really needed to do to keep this thing afloat. Flying by the seat of my pants would be a really good idiom to use for this period of the business. By 2014, we had added one new guy to the mix. I ran into a nice woman and her adult son, Chris, at the beauty shop one day. We started talking and of course, I told her about our chocolate venture. She was really interested in having her son become involved, so I agreed to allow Chris to come to my house once a week and make chocolate with us. There was no fee involved. I just thought it’d be nice for Blake and for Chris to have a social experience while doing something purposeful. But of course, that involved me running the class. So, now we were in the beginning stages of the development of training program. Word got out through various channels, and we expanded our program to include approximately 10-12 adults with developmental disabilities. I received a few small grants which assisted me in being able to offer the program free of charge. Chocolate sales were still on the smallish side, though growing. I started to think about the possibility of making this venture something that would eventually be able to provide jobs, so by the spring of 2015, I was able to offer paid employment to two of our chocolatiers. We were still working out of my home, and it was getting to the point where I realized this business was unsustainable in a cottage industry. I couldn’t make enough chocolate there to be really profitable, and even if I could, the laws are quite restrictive once you reach a certain point in gross revenues. Plus having 10 people in my house, the sound of the equipment, and just the constant tumult was driving my husband crazy, as you might imagine. I decided it was time to look for a commercial kitchen to rent. I tried to find someone or a business that would donate the space, but when that didn’t happen, I started renting time in the kitchen of a caterer in our community. Unfortunately, that turned out to be a disaster. The temperatures in their kitchens were way too hot to produce chocolate, and carting the chocolate back from the kitchen to my home in Florida weather was ridiculous. Plus, the time it took to set up and break down each day made it cost-ineffective. So, I had to give it a great deal of thought on whether we could sustain this business. I originally decided that we’d rent space in an industrial area, but that would mean we wouldn’t be able to offer the chocolate classes anymore as they are not zoned for that purpose. So, I began the search for retail space. After several months of a search, we found a small space in a strip shopping mall. And in the middle of January 2016, we began the process of constructing from the ground up, I should say, a place where we could hang our hat. I expanded our original concept of just making chocolate and hosting classes to adults with autism and other developmental disabilities to include new concepts such as a chocolate café in the front of the shop where we would be selling coffee and chocolate pastries in addition to chocolate confections. This new idea is designed to provide an additional revenue source as well as an opportunity to train and employee more differently-abled individuals. Also, we have expanded our classes. Now anyone from the community-children with and without disabilities, and people of all walks of life can come for classes or even have a party or event in our kitchen. Everything in the shop is designed to be user-friendly so challenged individuals are not held back. The methods we use to make chocolate and coffee, actually everything, are created with this concept in mind. As a speech therapist, I’m able to recognize individual concerns and tailor the program to meet those needs. I think that is one of the reason we are able to offer this unique opportunity. If someone needs a break, we have a low stimuli room for this purpose. If another person needs to sit to work for awhile, we can accommodate that as well. I actually make the environment work for them rather than try and change them to meet the environment. I personally think that is essential for an autism-focused business. I also don’t expect everyone to be great at everything. As time marches on, I see what part of the business the person excels in. Then we can offer work to them in that arena. At the time of this writing, I am just a week away from opening the shop (though by the time you read this, we will have been opened for over a month). It’s been a very long and difficult road, I must say. What was originally going to be a six-week construction project turned into a six-month ordeal. Most everything had an issue of some sorts, and the cost of the project was a good 50% higher than anticipated. The food business is a complicated one. There are permits after permits. Inspections upon inspections. But I didn’t choose the industry-it found me. And therefore, I believe that the next phase of this journey will be an exciting experience. I believe strongly in our mission and feel blessed to be a pioneer in the concept of providing employment options to adults with autism. Chocolate can be purchased on the Internet or, if you are in the Palm Beach Florida area, come and visit us. 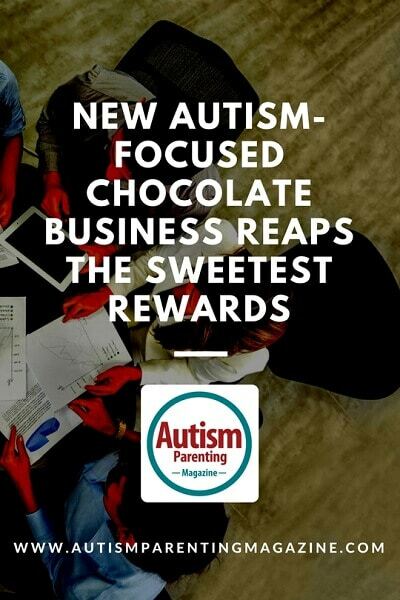 By helping to support autism-focused businesses such as The Chocolate Spectrum, you are assisting to increase the availability of programming for the future. And with the autism tsunami of adults soon to age out of the system, we need to be able as a society to increase opportunities for meaningful employment. So, here is our motto: Eat Chocolate — Support Autism! Valerie Herskowitz is both a speech pathologist and pastry chef/chocolatier as well as a mother to young man with autism. Ms. Herskowitz is a two-time Stevie Women in Business Award winner having won the 2004 Lifetime Achievement Award for her work with children with autism and then in 2014 for Female Innovator of the Year for having founded The Chocolate Spectrum. She is the author of two books on the subject of autism and has presented internationally. She is the President of the National Autism Registry and the Immediate Past President of the Florida Association of Speech-Language Pathologists and Audiologists.